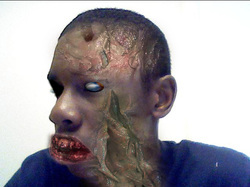 The zombie was interesting it was fun to do i was a little grossed out by it when I started to put the picture together but I came through and created this and i love it. I had to use the burn tool and feather tool. The different pictures of the picture I also use the click and drag tool.